On-campus Recommended Deadlines: July 1 for Fall. November 15 for Spring. April 1 for Summer. The Department of Entomology offers resident M.S. and Ph.D. programs and distance M.S. programs. The department makes a firm commitment to its students and provides strong mentoring relationships between the students and major professors. The department offers a strong curriculum and provides numerous professional opportunities for its students. This student-centered focus is reflected in the many awards received by the students and in their consistent placement in professional careers. The Department of Entomology is part of the Institute of Agriculture and Natural Resources, and is involved in research, teaching, and extension arenas. Department faculty are internationally recognized and work in both applied and basic entomology. 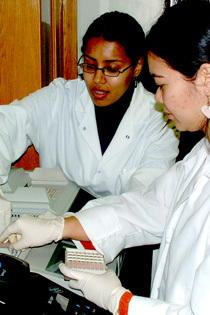 The department has research sites across Nebraska and collaborative relationships with both domestic and international scientists and educators. For additional details check out the dept./program website: Entomology.